It’s the last day of voting for Beer Is Culture, and we’re pleased to present a Q&A with one more finalist, Ken Ho. A recent emigre to Brooklyn via San Francisco, Ken works in the restaurant industry and illustrated this novel take on the theme. 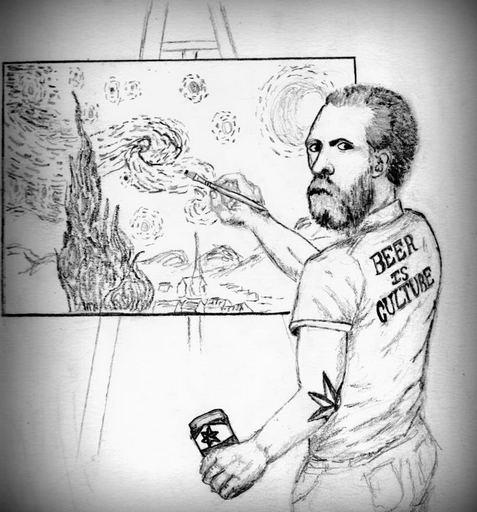 We’re a little star-struck by this depiction of a present-day Van Gogh crushing a Sixpoint can while at work. Here’s what Ken has to say about the piece, and more. As the artist, tell us a little bit about your entry. What is the inspiration and story behind it? I read about the competition on brokelyn.com and was inspired. I have always had a great appreciation for artists and their work. Thinking of images and artists that everyone would recognize, I picked Van Gogh and his Starry Night. With beer in hand, I started to sketch ideas to connect the concepts. I imagined what Van Gogh would be like if he were alive today. I tried to sketch him as if he was a bit annoyed, being interrupted in his moment of zen. Do you have any academic or formal artistic training, or are you self-taught? This was pure inspiration. I haven’t actually taken an art class since junior year in high school, 13 years ago. I used my girlfriend, Marisa, as a model to get the hand and body position correct. She has some formal training in art and gave me pointers with my drawing. Even before civilization, there is evidence of cave paintings by early humans. Flash forward to today, perhaps the most significant innovation and development for the artist in the past 30 years was the invention and proliferation of the personal computer, which has a remarkable efficiency in generating art. How does art generated by the artist on a computer relate to some of the more conventional art forms? The “eye” of the artist still has to be present regardless of the medium they choose to express their creativity. The computer is the new paint brush, pencil, and pen, enabling these classic materials to be digitalized and shared. There is however a whole new skill set that an artist has to develop to be successful with the computer and its millions of art programs. The internet however, has made it easier for an artist to gain exposure. Who are some of the artists who have influenced you the most? Obviously, Van Gogh. I enjoy the works of Dali and Picasso as well. I also admire up and coming artist trying to make a name for themselves. I have a few friends working hard to develop their portfolios with both traditional and digital media (Eileen Lei at http://leistory.com, and Chris Gaeta at http://www.wix.com/chrisgaeta/portfolio2#! ). Japanese and Chinese art has also influenced me. Specifically, ancient scroll art that has led to contemporary animation. I am also a big fan of tattoo art, and have a few of my own. We believe “Beer is Culture” given the synchronized parallel between the explosion of civilization, art, and culture and the cultivation of cereal grains by the earliest human societies. When you hear the phrase “Beer is Culture” what does it mean to you? I may be a bit of a romantic but I imagine beer and camaraderie going hand and hand throughout history. I picture our founding fathers drafting multiple versions of the constitution or declaration of independence while enjoying a nice lager together. Knights returning from battle in the middle ages to a tavern to enjoy a beer. As brewers become more innovative and develop new techniques, beers are perfected and tailored for specific palates. There’s even the new term, cicerone, or beer sommelier.